Provides future directions for workplace sociolinguistics as a field and makes a case for holistic research and multidisciplinary enquiry. Culture, Discourse, and the Workplace constitutes a key resource for students and teachers of intercultural communication and ESP and will also be of significant interest to researchers in the fields of workplace studies and business interaction. "This innovative and important work provides a rich resource for studying the complex, dynamic and political interface of culture, discourse and the workplace. It will inspire scholars interested in this interface by providing theoretical and methodological discussions and guidelines, as well as illuminating case studies." 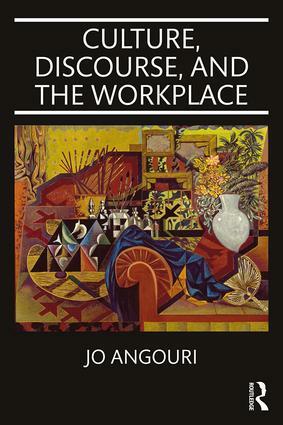 "Angouri’s synthesis, theorizing and analysis of international workplace discourse will appeal to both students and seasoned researchers alike. This useful book combines the best of a critique and a vade mecum of key analytic concepts." "Culture, Discourse and the Workplace offers an insightful analysis of how culture is made sense of in organizations. The discursive approach taken extends our understanding of the relationship of culture and discourse by elucidating how culture is talked into being – and its implications. The book does a great job in helping us to better understand culture talk from banal nationalism to mundane workplace conversations. A must read for discourse scholars and organization researchers alike." Jo Angouri is a Professor at the University of Warwick, UK and Visiting Distinguished Professor at Aalto University, School of Business, Helsinki, Finland.